Remember the days of free play, when the recess bell rang and you and your pals would storm the schoolyard for a game of Hide and Seek, Kick the Can, Tag, Hopscotch, and Double Dutch? You were independent. You were ingenious. You learned to be a leader – or a follower – all while using your imagination to achieve a common goal. Those days are back, even in this hyper-technological age of iPads, cell phones and laptops. Introducing Big Thought’s Thriving Minds After School Themed Boxes. These hard plastic trunks are fully stocked, portable exploration centers. Each trunk is thematic. There is always a book to encourage reading, a set of instructions, and a bag of clothespins. Kids write their names on a clothespin and then “own” the activity they are working on. As they move from activity to activity, the clothespin moves along with them. The boxes are in four Dallas ISD schools for kids in pre-kindergarten to 5th grade. Over at DeSoto ISD, six schools have boxes for kids in kindergarten and 1st grade. 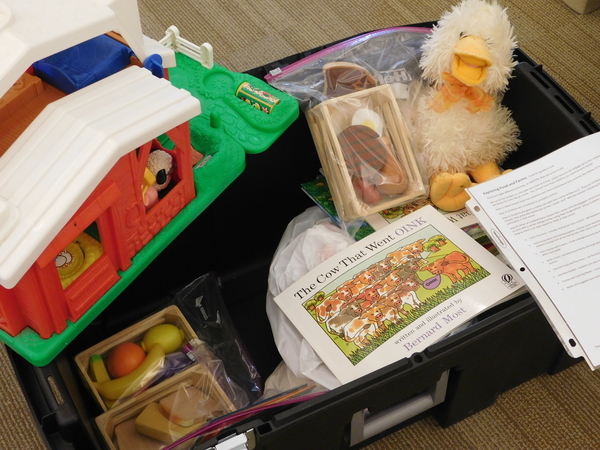 For kids in kindergarten through 2nd grade, there is Exploring Food and Farms and Exploring Transportation. For the older kids, there is a design trunk, as well as a shapes and connectors trunk. A dozen trunks are currently out at schools. After two weeks, schools trade trunks. To give kids that sense of freedom, of this being an opportunity for freethinking creativity instead of a regimented class assignment, a teacher’s aide supervises and motivates the kids to dig deeper in the activities. Kids are challenged to go a step further even when they think they are done. The idea for the trunks, or exploration centers, comes from the Montessori method of education developed by Dr. Maria Montessori. Montessori encouraged “multi-age groupings that foster peer learning, uninterrupted blocks of work time, and guided choice of work activity,” according to the American Montessori Society website. For kids in lower income households, these boxes are keys to unlock their inner potential, their leadership skills, their ability to work with others, and their free flowing imaginations. That’s the best way we can think of to close the opportunity gap. We aren’t surprised that the thematic boxes, which were conceived and culled by Schmidt, Big Thought’s Maria Marwill-Magee and kinder experts from the New World Kids program, are a resounding hit. Thriving Minds After School is supported in part by City of Dallas Office of Cultural Affairs; Pizza Hut; The David M. Crowley Foundation; Sid W. Richardson Foundation; Sammons Corporation; and Theodore and Beulah Beasley Foundation. Idania Fuentes sits inside the Casa View Elementary School cafeteria. Her three children hover around mom fueled by the ideal balance of poise and precociousness. There’s 10-year-old Erick, who aims to be an engineer when he grows up. Then we have 8-year-old Eduardo, who proudly announces he’ll be a soccer star. Finally, 6-year-old Marycarmen exclaims her plans to be a teacher. Erick, Eduardo and Marycarmen participated in Big Thought’s Thriving Minds After-School program during the 2014-2015 year. But this story isn’t about the kids. This time the focus is on the parents. Fuentes and her husband Isidro Campuzano are two-time graduates of The Concilio program. Established in 1981, The Concilio is a nonprofit, community-based organization dedicated to bridging the gap between parents and the educational system. The Concilio does focus on the growing Hispanic population, but classes are available for parents of all backgrounds. What are mom and pop studying? Education and health are top of mind. Parents learn valuable lessons on preventing childhood obesity, which is prevalent in Hispanic families, by motivating their kids to eat healthy, balanced meals and exercise regularly. The education classes help parents navigate the rigors of homework, high school and college readiness, and the sometimes complicated process of choosing the right courses for their children. A decade ago The Concilio partnered with Big Thought to provide parental classes at the Thriving Minds campuses, including Marsh Preparatory Academy, Medrano Middle School (whose April 14 Concilio ceremonies featured 46 parent graduates), Anson Jones Elementary School, Lorenzo De Zavala Elementary School, G.W. Carver Learning Center, Harold Wendell Lang, Sr. Middle School, Jerry R. Junkins Elementary School, and Casa View Elementary School. Fuentes and Campuzano graduated from the 2014-2015 program titled Parents Advocating for Student Excellence (PASE), which was conceived by The Concilio, and the 2015-2016 companion Padres Comprometidos (PC) program, created by the National Council of La Raza. PASE specifically focuses on giving parents of all socioeconomic and cultural backgrounds the tools they need to swim through the school system, tackle academic challenges, foster a home learning environment, and visualize higher education. PC is all about getting parents to play a leading role in preparing their children for college. The graduation ceremony, where parents walk the stage and receive a certificate, was held at Casa View. The Concilio stretched into nine weeks with 90 minutes of classes each week at Casa View. While mom and dad are in class, the kiddos are supervised as they complete their homework. 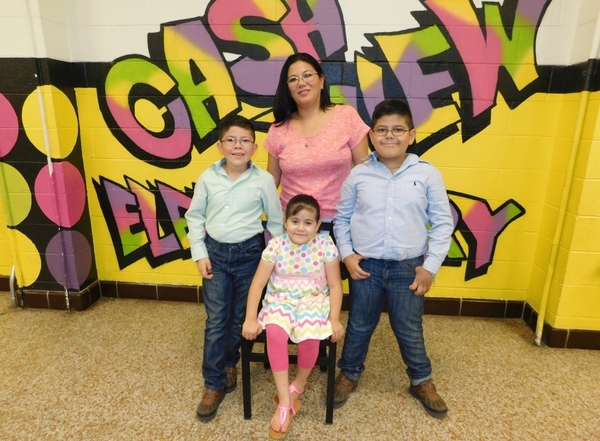 For Fuentes, The Concilio has made a huge difference not only in her own knowledge and engagement with her kids’ schooling, but it has also improved her husband’s connection with his children’s scholastic journey. Clearly the bonding has been significant. Fuentes quickly mentions The Concilio’s Healthy Kids, Healthy Families program as a saving grace. Turns out she had all the ingredients for healthy eating, but needed a viable recipe. That means Erick, Eduardo and Marycarmen will excel in school, effectively turning their poise and precociousness into fruitful academic careers. Big Thought’s Thriving Minds appreciates the generous supports of ACE, City of Dallas Office of Cultural Affairs, The David M. Crowley Foundation, Dallas ISD, Lockheed Martin, Roy & Christine Sturgis Charitable Trust, Target, Texas Instruments Foundation, The Pollock Foundation, The Wallace Foundation, Sid W. Richardson Foundation, United Way, Rees-Jones Foundation, and The Hillcrest Foundation. It was Daisy Gamboa’s first time in New York City. In fact, it was the Anson Jones Elementary 5th grader’s first time on a plane. Yet there she was potently delivering her poem titled “Bullying” at the National Poetry SLAM! in the Big Apple. Daisy was chosen to represent Dallas by America SCORES. She was one of only 14 young poets that took the stage April 11. (In the photo above, she’s the last one on the left.) Daisy traveled to New York with Donna Carey, her poetry coach at Anson Jones. The pair spent three nights in the city that never sleeps. This is the third time that a student from Anson Jones Elementary gets chosen by America SCORES to represent Dallas in the National Poetry SLAM! So is Carey, who watched Daisy blossom through her poetry. Daisy is a student of Big Thought’s Thriving Minds After School program, and through her exposure to poetry, soccer and service, all hallmarks of the America SCORES mission to nurture active minds, active bodies and active community members, she has learned valuable social-emotional lessons. It was a fundraiser for America SCORES at the Dallas Farmers Market earlier this year that introduced Daisy to the world of spoken word reading. Carey says it was the first time that Daisy ever spoke in public. For Daisy the New York trip was an eye-opening journey. It was her grown-up adventure, an experience that helped close the opportunity gap that disproportionately affects under-resourced children and youth in Dallas County schools. She basked in a different surrounding, an exciting new city, and met kids from other schools and other states. New York also gave Daisy a real-world course in poetry. We thank all of our generous Thriving Minds supporters. For a full list of Thriving Minds donors, please click here. The light of opportunity keeps shining. 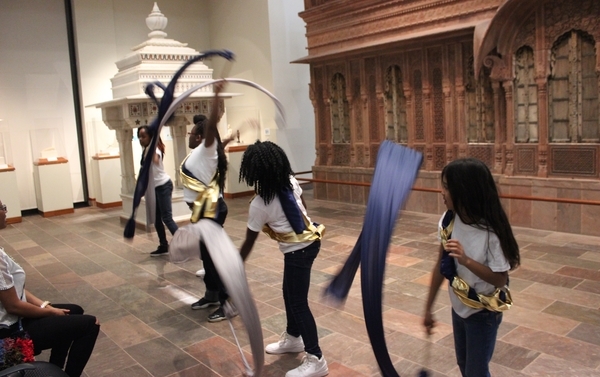 That light beamed in the eyes of 10 kids from Village Oaks Apartments as they showcased their talents before an appreciative audience April 23 at the Grand Gallery inside The Trammell & Margaret Crow Collection of Asian Art. Flanked by stunning marble pieces and with a breathtaking architectural wall behind them, the kids offered songs, choreographed dance routines, spoken word pieces and original artwork. The entire program featured an Asian exploration theme to match the ambiance and artistic purpose of the Crow. The Crow Collection, Big Thought, Behind Every Door and Sway Enterprises, along with the help of non-profit organization Music Is Our Weapon, worked together to conceptualize a 10-week after school program where kids would work toward a culminating performance at The Crow. That means the event was a milestone for these children: Karla Tapia, 2nd grade; Loryol’ti Webb-Creeks, kindergarten; Eimani Kelly, 4th grade; Detra’kaye Tyler, 4th grade; Briyannah Wilson, 5th grade; Shatavia Burus, 7th grade; Jeremy Miller, 6th grade; Jaqualian Burus, 8th grade; Kennon Murray, 5th grade; and Jakobe Davis, 7th grade. Score one for these kids. Here we have living proof that the opportunity gap disproportionately affecting under-resourced youth in the most poverty stricken areas of Dallas can be narrowed. The shine of opportunity glows in a child. Opportunity is a catalyst, a key that unlocks a portal of possibilities that once seemed out of reach. The Village Oaks kids, all part of Big Thought’s Thriving Minds After-School program, began their journey to The Crow in February by attending the museum’s Chinese New Year celebration. The Crow then provided weekly visual art programming, participated in check-in meetings to bring staff from each participating organization together to tout successes and assess needed adjustments. In preparation for the big showcase, The Crow also created formal invitations and an event program, as well as staged the student artwork display and provided food and drinks. That light of opportunity is exactly what guides Behind Every Door to spend the last five-and-a-half years working with the Village Oaks kids. 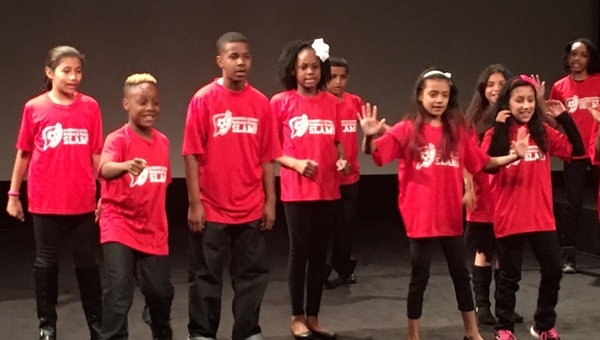 Will Dowell, executive director of Behind Every Door, was on hand at The Crow showcase to share in the joy of accomplishment shared by the kids onstage. And the light of opportunity keeps shining. Picture an evening under the stars, mingling with friends, as an urban hardwood forest becomes your panoramic backdrop. Then imagine a bright sunny day filled with adventure in a natural wonderland dotted by wetland and prairie habitat. That’s Big Night and Big Day – nature retreats, Big Thought style. Both Big Thought events take place at the sprawling oasis Trinity River Audubon Center, and its gateway to the 6,000-acre Great Trinity Forest, which is the largest urban hardwood forest in the United States. And yet each has a different mission: Big Night, May 6 from 7-10 pm, is a casual, adults-only shindig aimed at raising funds for innovative programs designed to close the opportunity gap that disproportionally affects our most under-resourced students. At the inaugural Big Night, you’ll enjoy live music by Paradise In the Sun, craft beer and wine, gourmet tapas, and a S’mores bar. 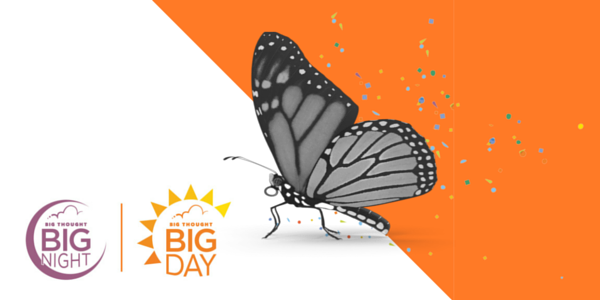 The fourth annual Big Day, kicking off the morning of May 7, is all about the kids. From 9:30 am-1:30 pm TRAC will become a haven for exploration accommodating 1,000 Thriving Minds students and their families. The possibilities are endless – peak into the world inside a pond, check out crawling insects, build a fort-like shelter, track animal waste (that one could be messy! ), get up close and personal with reptiles, and embark on a scavenger hunt. All of this talk about nature, wildlife, forests and even animal poop brings Earth Day to mind. Earth Day is April 22, which commemorates the 46th year of this momentous occasion. Earth Day is about preservation, of course, but also about innovation and inspiration. It’s about leading the crusade for the environment, about never taking for granted what lives and breathes all around us, and always making sure that raw potential reaches its greatest natural peak. At Big Thought we believe that all children have the seeds of knowledge, imagination and maturity. It’s up to us to make sure those seeds get watered and nurtured so that they blossom. Big Night and Big Day serve as the creative landscape, as outdoor classrooms primed for teaching moments. The kids – and the adults – are ready for the lessons. We would like to thank our Big Night Honorary Chairs Marianne and Roger Staubach, as well as Chairs Melora and Bill Leiser, and Co-Chairs Emeka Anyanwu, Alison and DeWitt Corrigan, Giles Davidson, Irene Hosford, Trish Parks, and Ginger Sager. We also express deep gratitude to our many sponsors. Prom night rules as the annual rite of passage for teens. It’s an evening for corsages, tuxedos, gowns and slow dancing. Girls morph into young ladies, and boys become gentlemen. For the blossoming students of the TC Marsh Leadership Cadet Corps (LCC) at Marsh Preparatory Academy, prom night is the LCC Military Ball, which takes place May 6 at Lovers Lane United Methodist Church. This is their coveted event, their moment of social-emotional maturation. The ball includes dinner, an awards presentation, a change of command ceremony, a special guest speaker, two photo slideshows, and a dance. So naturally these ladies need dresses, accessories and make-up. After all, this is their night to shine. The LCC members, forming part of Big Thought’s Thriving Mind After School program, spent March 4 at St. Andrew Prom Closet 2016 in Plano, an event of St. Andrew United Methodist Church now in its eighth year. 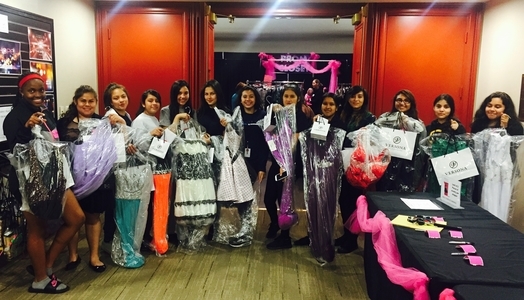 Thirteen young ladies got the royal treatment from the Prom Closet volunteers. They chose gowns, shoes, necklaces, earrings and bracelets. Beauty products rounded out the bag of ball goodies. Bernice Davis, mother of 14-year-old Cyniece Davis, an 8th grader who’s in her third year with LCC, couldn’t be happier for her daughter. She has nothing but praise for the Prom Closet experience. The Prom Closet experience is yet another way that Big Thought’s Thriving Minds program continues to close gaps and build bridges. The LCC ladies work hard all year with service projects, from food and clothing drives to Wreaths Across America, and their rigorous leadership classes. They planted the seeds, and now spring brings the blooms. The Military Ball is their much-deserved bouquet. Corporal Gaytan is particularly elated because she looks at the generous work of the Prom Closet volunteers as a reciprocal thank you for the LCC’s service-focused endeavors. Dresses, shoes, necklaces, earrings, bracelets and makeup. The LCC ladies are ready. Their Military Ball promises to be better than prom night.